JUSTELLA'S GRANDMA: Aarons first shopping trip. We took Aaron on his first shopping trip yesterday, he is just 12 days old, and where did we go, to the fabric store of cause. As all quilters will know the only place to go . We brought fabric to upholster the dining room chairs. 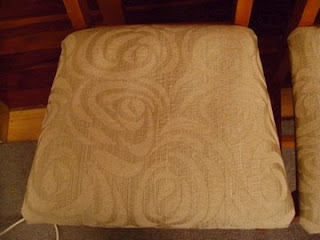 This is a neutral shade I have taken photos to show you I hope you will be able to see the pattern. So I have been busy doing the chairs 4 in all. I was very pleased with the result. 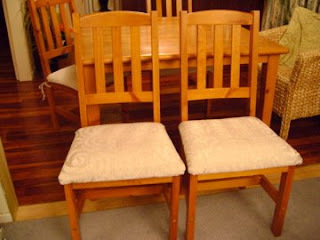 I think I will go home and do the same to my dining room chairs they are starting to show ware. We also brought fabric to make a baby sling to take him out in. Picked a nice patterned cotton for the inner and a olive green drill for the outer. I used it to day and it was nice to use. Made it easy to carry him. I hope it will be of some use. Of course there was a sale on so I couldn't resist buying some fabric at $1.99 a metre. 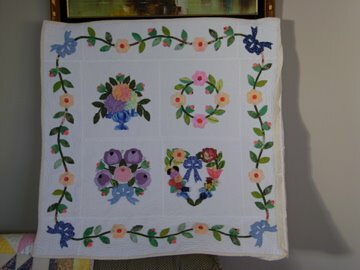 I brought 3 mtres of it for quilt backings.